In a Kadai take some oil. When hot, fry the onion till transparent. Grind tomato, ginger, cumin, black pepper and green chilly together. 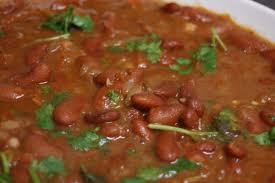 Add the soaked rajma with water and add salt and pressure cook for 1 whistle. Keep in high and cook for few minutes. Garnish with coriander leaves and serve Hot and enjoy!! !